You are here: Home » Get Artsy Editor for Free! As y’all know, we are just getting started. 99.99% of WordPress users don’t know about Artsy Editor. Today, we are launching a campaign to help more people learn about us and increase our brand awareness. 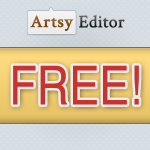 We are giving you the opportunity to share with your friends and colleagues about Artsy Editor, and in turn, get something valuable back from us – in this case, a free license! A. Head to http://demo.artsyeditor.com/wp-login.php, write about anything you have in mind, append “Written in Artsy Editor“, get the HTML, and publish it on your blog! B. If you are even more awesome, write an honest review of Artsy Editor on your blog. There is absolutely no limit of what you can talk about, as long as you mention us and provide a link back. How can Artsy Editor help you write faster? 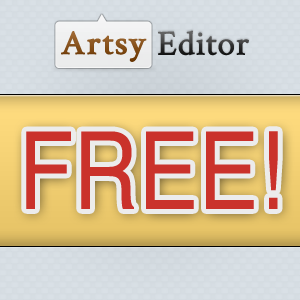 Why will you recommend Artsy Editor to your clients/colleagues? Why is Artsy Editor better than WordPress distraction-free editor? After you completed any of these, send me the link of your post to stephen@artsyeditor.com and I will get you set up with a free Hobbyist license! 1. How many sites can I use my Hobbyist license on? Hobbyist license can be used on one site. If you want to upgrade to a Professional (5 sites) or Developer (unlimited sites) license, I can give you a discount as well. 2. How many licenses can I win in total? 3. How long will this campaign last? It will be available until July 31st. I might extend this to a discount price (instead of free) afterward. But it won’t last long. So head to http://demo.artsyeditor.com/wp-login.php right now and get your writing spirit going! PS: This is just our first creative marketing campaign, we have much more coming up. If you subscribe to our blog, we can keep you up to date! ← What’s New in Version 1.1? Personally I think price should have been cheaper than it is… 99$?? ?